For example, if you or your developer have made custom changes to the site, updates can overwrite those changes. Fortunately, there are ways to deal with this problem beyond simply re-creating the alterations manually. With the right plugin, you can keep all your hard work from being undone. In this review, we’re going to introduce one tool that purports to do just that – WordPatch. We’ll discuss its core features and pricing, and even walk through what it’s like to use. Let’s get started! Most WordPress sites require a lot of updates. WordPress itself puts out new patches and versions, of course, as will your plugins and themes. Ignoring these updates can result in security holes, broken features, and compatibility errors. If you run a simple WordPress site with no custom coding, all you have to do is perform updates as they come up. However, what if you (or your developer) have made custom additions to your site’s files? By default, the WordPress update process overwrites many of these modifications. This applies to WordPress core, as well as to plugins and themes. This can mean that every time a new significant update comes out, you have to spend valuable time re-doing any custom code that is essential to your site’s operation. This sounds promising – but you may be wondering whether this plugin can live up to its claims. That’s why we’ll be reviewing it in depth, starting with what exactly it can do. The basic functionality of WordPatch is pretty easy to grasp. However, if you’re trying to decide whether or not this plugin is right for you, you’ll probably want more details. For that reason, it’s worth exploring what WordPatch is capable of. Uses Unix patch files to re-apply custom changes to your site immediately after they are removed by an update. Includes rollback functionality that lets you return your site to a previous state, in case something ever goes wrong with the update and restore processes. Retains a log with detailed information about what has been modified and when. Provides comprehensive feedback and notifications in the event that a modification fails to work properly. Secures all information sent through the plugin, ensuring your privacy. Offers a simple setup wizard that gets the plugin going with little effort on your part. All-in-all, this is an impressive set of features. In particular, it’s reassuring how many safeguards WordPatch puts in place. Every site’s setup and modifications are unique, which can result in unexpected scenarios. If an update doesn’t go smoothly, however, you’ll know about it immediately and be able to restore your site quickly. So far, we’ve been discussing this plugin in the abstract. Of course, it’s important to do your research about any new plugin, and be aware of what it has to offer. However, it’s also highly valuable to get a little hands-on experience with an unfamiliar tool like this. Therefore, we’re going to walk through what it’s like to set up WordPatch, and check out its settings and features. Without further ado, let’s jump right in! After installing the plugin, there’s still quite a bit of setup to complete. Fortunately, there’s a setup wizard that will walk you through the process. This is one of WordPatch’s more handy features. This first page contains some basic information that will help the plugin connect to your site. This includes your site’s host and database, for example. Fortunately, most of these details are filled in automatically, so you aren’t likely to have to change them. All you’ll really need to do is enter your database password, which you can usually find in your hosting control panel. 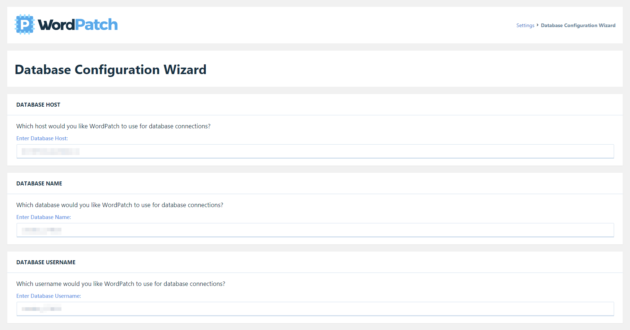 After that, you’ll simply need to continue through the setup wizard, providing the information that’s asked for. Most of this process is self-explanatory, but there’s also a detailed documentation article to help you out if you get stuck. There are some basic options here, such as the language you want to use. However, there are also plenty of more advanced settings. For instance, you can choose to set the plugin to either Optimistic Mode or Pessimistic Mode. The former approves modifications that have not been explicitly rejected, while the latter provides more of a fail-safe. Which one you opt for will likely depend on how many modifications you’re running, and their overall complexity. You can also configure some settings related to timing and automatic retries. In particular, you’ll likely want to set the Update Cooldown time to be as short as possible. This means your custom modifications will be applied almost immediately after an update occurs, providing a seamless experience for your users. Finally, it’s a good idea to enable the Maintenance Mode setting. After an update occurs and before modifications have been successfully applied, this will display a maintenance page to your visitors. That way, they won’t be able to see your site until it’s fully up-to-date. Saving these settings will apply them immediately. Of course, you can always come back here later to re-configure them as necessary. You’ll need to give your mod a title, for example. As the advice on the page suggests, this should be detailed and specific, especially if you’re planning to include a lot of mods. Then you can go on to specify a directory for your mod, and configure the way it works. You can decide whether or not it will run automatically after each update, and so on. Plus, you can even set it up so that this mod diverges from the global settings (such as by giving it a different cooldown time or moderation mode). Here you can add a filter, which you’ll be able to use to connect your custom modifications to the plugin. This can be done manually, if you’re comfortable with that approach, or by using another helpful wizard. After that, you simply need to tell the mod to start running. From that point on, it will apply any patches that are associated with it when updates occur (and according to the settings you configured). You can add additional patches to this mod if you like, and create as many mods as you need. All-in-all, WordPatch is surprisingly easy to use despite the complex functionality it offers. Its features are streamlined and clearly organized, and the setup wizards make it easy to get started with. What’s more, most settings and options are clearly explained within the dashboard. If not, you can usually find help quickly in the plugin’s documentation. Of course, you’ll still need some technical know-how to make sense of all WordPatch’s features, and to use it safely. If you’re a developer, you shouldn’t have any trouble getting the hang of this plugin fairly quickly. If not, you’ll definitely want to get your website’s developer on board to set everything up. Finally, let’s quickly address some more practical matters. WordPatch is a premium plugin, which means that you’ll need to pay a fee in order to benefit from its features. Unlike some plugins, WordPatch makes its options very simple. There’s no difference in the functionality or support offered by the three tiers. You’ll get everything you need with the basic $49 per year plan. Instead, the only distinction lies in the number of licenses you’ll receive. The Economy plan is good for a single website, for example. 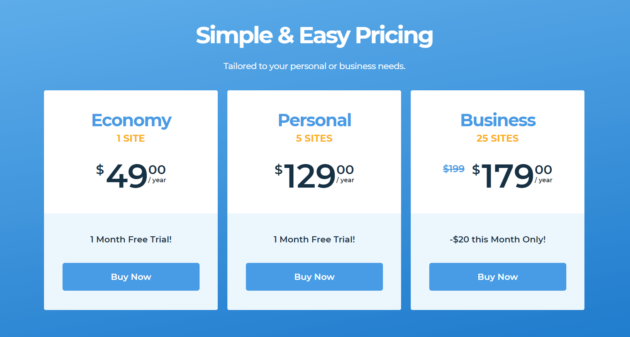 The Personal plan offers 5 licenses for $129 per year, which is useful if you’re a company with a few different sites. Finally, the Business plan is perfect for developers, since it supports up to 25 sites for $179 per year. That comes out to just over $7 per license, which is a solid deal if you develop for a large number of websites. So, how did WordPatch fare in our review? Overall, we found it to be a useful tool that lives up to its own claims. It provides an excellent feature set for a reasonable price, including lots of safeguards to ensure that it won’t harm your site. What’s more, it’s streamlined and supported well enough that the learning curve is quick. As for who can benefit most from using this plugin, it will come in handy on any site where you’ve made more than a few basic modifications. If you run one or more websites with a lot of custom additions and functionality, you’ll likely find that WordPatch saves you a lot of time and trouble. Just make sure that if you aren’t a developer yourself, you have one on hand to configure the plugin fully (ideally, whoever performed your site’s modifications in the first place). Have you tried WordPatch, and what did you think of it? Share your thoughts with us in the comments section below! This looks completely useless to me. Site owners shouldn’t be making changes to those files anyway, that’s what plugins and themes are for. I don’t think people should be using WordPress if they need to edit core. They should find a more suitable platform for their purposes. I don’t think this plugin is about modifying the WordPress core files (and if it is, I agree with Ryan); I think it’s about automatically applying tweaks and changes to plugins and themes after they are updated. Great concept. We frequently need to do this manually to plugins we’ve installed. They are basically what we want but need a little tweaking beyond just CSS. Except for the fact that themes and plug-ins are unable to make changes to the core or even fork existing plug-ins. Next Entry: Elementor vs Beaver Builder Page Builder: Which Should You Choose?